Phoenixville Firebird Festival - Complete Schedule (with links) - Saturday 12/6 - OneNineFourSixZero - Phoenixville Reviews, Events, + more! This Saturday, December 6th marks the date of Phoenixville's beloved Firebird Festival, a celebration that represents the borough's namesake - the Phoenix. Now in its 11th year, the festival held at Friendship Field (at the corner of Franklin and Fillmore) seeks to foster a collaboration of local artistic and creative talent, and to enhance the cultural life of Phoenixville. A recent short film that details the year-long process can be viewed HERE. This year, the Firebird Festival met its crowd-funding campaign goal of $5,000 on Indiegogo; A true triumph given the fact that 9 of the 10 previous years were not given financial support. The funding will go towards insurance, portable restrooms, a stage and sound system for performers, compensation for performers, and construction materials, just to name a few. It should also be mentioned that festival is run entirely by volunteers, from the designing of the Phoenix, to the construction, through the running of the actual festival. This year’s Phoenix is over 30 feet tall and features a moving head. Henrik Stubbe Teglbjaerg, festival organizer, says, "The festival is an excuse for our community to come together and celebrate life and our creativity. The real festival is all the preparation, where so many pitch in to make it work, and we get to stretch our imagination. I grew up in Denmark where we have all this tradition and how you're supposed to do things, but here (in America) there's this blank slate where anything is possible and you can come up with a crazy idea and run with it." Teglbjaerg’s "crazy" idea of the Firebird Festival has gained a healthy momentum since its inception and peaked in 2012 with a record attendance of over 16,000 people, which is nearly the entire population of the town. In a recent article in the Philadelphia Inquirer, Alan J. Heavens writes, "Of all the reemerging boroughs in the Philadelphia area, Phoenixville may be the coolest, and not just because the Colonial Theatre remains 'healthfully' air conditioned. Where else do thousands gather every December, snow or not, to celebrate the rise from the ashes of this former industrial powerhouse by burning a giant wooden phoenix?" The year, in celebration of the event, there will be over 100 performers from 3 PM to 7 PM in various venues and on the sidewalks of Bridge Street downtown Phoenixville. Food Vendors will be set up from 3 pm till 10 pm: Uncle B's BBQ Shack, GiGi & Big R Soul / Caribbean Food Truck, Just Jackie's Food Truck, Undrgrnd Donuts, Pbons Fresh Phood, The Cow and the Curd, The Sunflower Truck Stop, and others. At 7:30, an impromptu parade of performers, dancers, etc will make its way from Bridge Street over the Gay Street Bridge and up to Friendship Field. There will be three shuttle buses running from Bridge Street to the Firebird site. 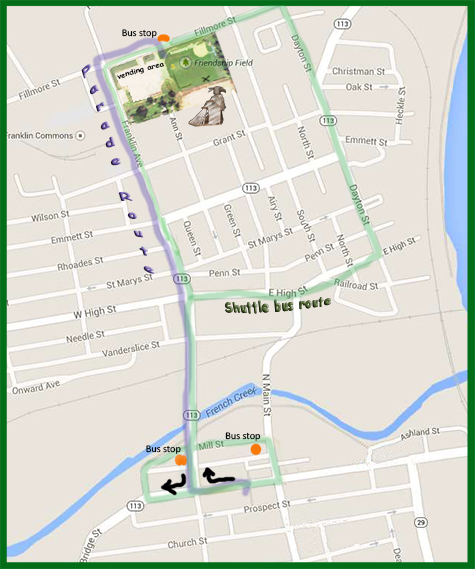 A map of the parade route and shuttle bus route can be found HERE. Finally, the lighting of the Phoenix will commence around 8:15 PM. Teglbjaerg says, "Every year has been different with different challenges and opportunities. The good will toward the festival remains a constant. New people get involved, as the awareness of the festival grows. Where we are heading into the future with the festival, I don't know. My main objective is the community, not the festival, so where do we want to go? We humans can be incredible generous when there is a good will. It is heartwarming to experience such an out pour of contributions in so many different ways. As a community, we can be proud of ourselves. Thank you to all of you." 3:30 - 4 PM - Dagmar Hoell telling the adapted Lenni Lenape story " Rainbow Crow"